The Big Dance is about to start and the casino bosses at Intertops Casino have clearly been struck with a severe case of March Madness. To celebrate the culmination of the American college basketball season, the popular US-friendly online casino is giving away $60,000 in March Madness Bonuses. Every week in March 200 active players will find up to $250 dropped in their account. On April 4th, 2011, a grand prize draw will be held to award additional cash bonuses of up to $500. 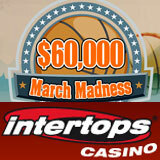 All that’s required to qualify is to play any of the more than 300 games at Intertops Casino between now and April 3rd. Bonus levels are based on game-play performance with points awarded for bets, profits and losses. One of the world’s oldest and most trusted US-friendly online casinos, Intertops Casino has an amazing selection of instant-play and download casino games to choose from including 3 and 5 reel slots, multi-hand video poker, and traditional casino favorites like Blackjack and Roulette. Intertops Casino is one of the few online casinos to host daily slots tournaments where players can play against each other on some of the site’s most popular slot machines. Intertops has the biggest progressive jackpots currently available to American casino players. Jackpot Pinatas is currently over $1.6 million. Other million dollar jackpots are the Aztec's Millions ($1.2 million) and the Midlife Crisis/Shopping Spree ($1,055,000). Cleopatra's Gold is worth over a quarter million. Intertops, which recently celebrated the fifteenth anniversary of the day it took the very first online bet, welcomes players from around the world. It is known for quick, hassle-free deposits and withdrawals and excellence in customer service.